As regards the world’s future, humans today tend to polarize as optimistic, pessimistic, somewhere in between or confused. But we believe the crux of the matter is simple. We’ll all be all right when Hindus, like-minded people and Hindu-inspired entities enter dynamically into the conversation and share their salutary perspectives. Today’s Hindu renaissance is but a bare beginning of what the future holds, we are convinced–provided enough of us do our part. In this unfolding story, we foresee our humble magazine continuing to be a major influence globally. Next year the monastic staff will be celebrating their fortieth anniversary of continuous publishing, having sailed smoothly from newspaper to glossy magazine, and now to a slew of digital versions and apps. “And we are just getting started!” we hear from the apprentices, while the publisher and editors plan the next powerful forty years. Everything is poised and ready to go. All Hinduism Today needs now is long-term financial security. 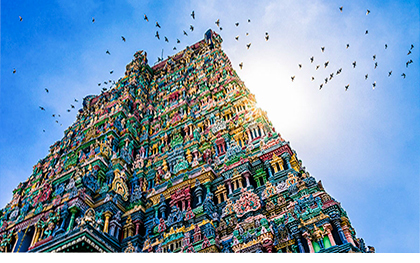 To this end, the Hinduism Today Production Fund was established, an endowment to eventually guarantee a long and unbroken continuity for the magazine, regardless of any worldly ups or downs. It is counted on to provide current and future editors the wherewithal to keep on creating a top-notch magazine, worthy of its precious subject matter. We invite you to be part of this endeavor, to donate to the Production Fund and include it in your estate plan, thus to prepare a grand future for your children and grandchildren, a world with lots and lots of hope in it–and a grand world for you, too, when your turn comes to live in it once more. Our timeless wisdom says, “You cannot give anything but that it comes back to you in greater measure.” Om. In the meantime, if you need clarifications or help of any kind, do contact us. We are always here. You can also visit hheonline.org for the essentials of estate planning told in simple and clear terms.